A DMRC official also added that the Ashram metro station has become a model for stations across the world. 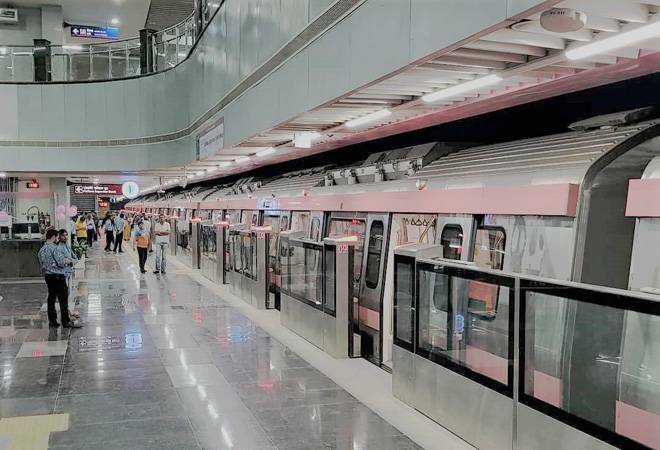 Delhi Metro's Lajpat Nagar to Mayur Vihar Pocket 1 stretch of the Pink Line was flagged off today by Union Minister of Housing and Urban Affairs Hardeep Singh Puri and Deputy Chief Minister of Delhi Manish Sisodia at Metro Bhawan Auditorium. This 9.7 km stretch on the Pink Line will link seven stations, including Lajpat Nagar, Vinobapuri, Ashram, Hazrat Nizamuddin, Mayur Vihar Phase 1 and Mayur Vihar Pocket 1. Apart from easing the commute for travellers, this new corridor is also touted to have the world's smallest metro station. The Ashram Metro Station with a size of just 151.6 metre against the usual 265 metre has set a new record. The Ashram metro station will be operational from 4pm today. Some parts are not even inside the station but in sites that the DMRC had to look for, including below the Ashram flyover. When the metro station was planned, DMRC did not foresee the land acquisition issues that would accompany the project. Instead of waiting for the issue to resolve, the DMRC re-planned the station and came up with a new design. "There was a private land that we could not acquire. Instead of waiting for two years battling the court case and delaying line, we came up with the new design," said a senior metro official, as mentioned in a report in Hindustan Times. What the DMRC did was reduce the size of the station in half, while expanding it vertically. The official also added that this station has become a model for stations across the world. The Ashram metro station is smaller than the Bhikaji Cama Place metro station that has a length of 225.5 metre and is currently the smallest operational station in the DMRC network. The platform for a six-coach train is 140 metre but has been reduced to 135 metres in the Ashram station. The station will also welcome passengers on three levels as against the usual two. A mezzanine floor has been added along with the concourse and platform levels. "As soon as commuters descend from the stairs, they usually land on the concourse level. But here they will first land on the mezzanine level, where the ticket and security counters are built," an official said, as mentioned in the daily. The cooling towers, pump room, generators etc are all built on a nearby plot. There will also be vibrant art work around the theme of 'mother and child' in the Ashram metro station.